Not only is it a struggle to deal with active acne, but the scars and pits left over from years of acne don’t have a simple fix, especially if you aren’t candidate for deep laser treatments. Scarring occurs as the skin attempts to heal. The newly produced collagen becomes disorganized and thickens, because the epidermis anchors to the underlying skin layers, this results in scarring. The scars types are described by their appearance such as “ice-pick”, “rolling” or “boxcar”. Micro needling can be a great solution to soften or minimize the appearance of scars left over from acne. This treatment creates micro injuries that target the area where the dermal inflammation has occurred and breaks-up fibrous tissue to fill-in where there has been a loss at the site of the acne lesion. For some the solutions to acne scars can be lasers treatments but unfortunately not every skin tone is a candidate for lasers. Micro needling is safe for all skin types (Fitzpatrick I-VI) and the down time is very minimal compared to weeks of downtime with deep laser treatments and no risk of burns. Like wrinkles, most acne scars are visible because they are lower or deeper than surrounding skin. Micro needling will even out the complexion and improve the appearance of scars. The mechanism is to stimulate your own body’s healing to do that, at the same time it treats tone, texture and tightens.One of the main benefits is that skin tightens and improves long after the treatment itself. Micro needling promotes inner healing of the dermis to tighten and smooth the skin as collagen begins to lay down in a more regular manner through the layers of the skin, to the upper layers where smoother more regular texture will appear. 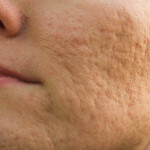 Many men and women with acne scarring are enjoying the benefits of significant reduction of scar depth even after a single treatment and although results vary from person to person, it is likely that you’ll have to undergo several treatments to get the appearance that you are looking for. Treatments can be spaced out every 4-8 weeks depending on how well your skin heals and the lifestyle of the patient. Here at Renue Aesthetic we use the The Eclipse Micropen. This device has a patented high-speed motor for fast penetration of the needles. The adjustable needle depth allows for customized treatment. In most cases a topical hyaluronic acid (HA) peptide gel is applied to clean skin to help the tip glide across the skin while delivering topical HA deep into the skin. As the tip is applied to the skin, thousands of superficial micro-channels are created every second.